The rapid creation of comprehensive brain image databases mandates the development of mathematical algorithms to uncover diseasespecific patterns of brain structure and function in human populations. We describe our construction of probabilistic atlases that store detailed information on how the brain varies across age and gender, across time, in health and disease, and in large human populations. 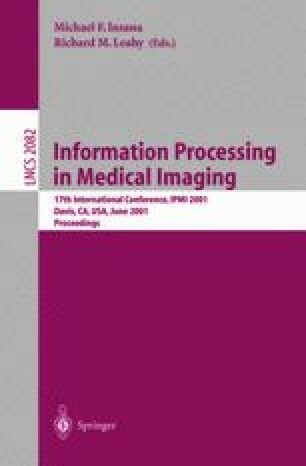 Specifically, we introduce a mathematical framework based on covariant partial differential equations (PDEs), pull-backs of mappings under harmonic flows, and high-dimensional random tensor fields to encode variations in cortical patterning, asymmetry and tissue distribution in a population-based brain image database (N=94 scans). We use this information to detect disease-specific abnormalities in Alzheimer’s disease and schizophrenia, including dynamic changes over time. Illustrative examples are chosen to show how group patterns of cortical organization, asymmetry, and disease-specific trends can be resolved that are not apparent in individual brain images. Finally, we create four-dimensional (4D) maps that store probabilistic information on the dynamics of brain change in development and disease. Digital atlases that generate these maps show considerable promise in identifying general patterns of structural and functional variation in diseased populations, and revealing how these features depend on demographic, genetic, clinical and therapeutic parameters. This work was generouslysu pported by research grants from the National Center for Research Resources (RR13642), National Libraryof Medicine (LM/ MH05639), NINDS (NS38753), the National Science Foundation (BIR 93-22434) and bya Human Brain Project grant known as the International Consortium for BrainMapping, which is funded jointlyb y NIMH and NIDA (P20MH/DA52176).